What is Pareidolia? The psychological phenomenon of Pareidolia is defined as "a type of illusion or misperception involving a vague or obscure stimulus being perceived as something clear and distinct". The most common thing for people to see is faces and animals. My interest in Pareidolia began when a woman bought a painting from me of a cloud scene claiming to see the child she lost at birth within the cloudscape. Since then I have always been interested in the reasons we see seemingly significant illusions. In early 2000 a woman named Diana Duyser claimed to see the Virgin Mary on a piece of toast. She auctioned the item off for 28,000 dollars. In 2006 a satellite image of a face in the Cydonia region of Mars was discovered, which led to conspiracy theories that the United States was trying to hide the existence of intelligent life on Mars. I am interested in the reasons we see faces in inanimate objects. There has been scientific evidence supporting the theory that as humans, our brains are programed to instinctively recognize faces primarily. Perhaps initially as a way for humans to determine who is a friend or an enemey. 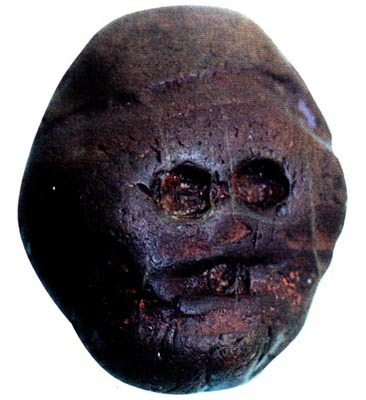 The oldest artifact ever found is the Waterworn pebble, from Makapansgat South Africa, dating back to 3,000,000 BC, which actually resembled a human face. It suggests that a humanoid found this unaltered pebble and found it significant enough to pick up because of its close resemblance to a face. So still the question comes up...Why do we as humans see faces everywhere!? Is it possible that other species experience Pareidolia?